Highlights of investigative stories reported solo or as part of a team. Generally, these stories were driven by data analysis. Data analysis shows Toyota tops speed control complaints: USA TODAY, March 26, 2010. Since 2004, components related to vehicle speed control showed up at a higher rate in consumer complaints about Toyota vehicles than in five other major manufacturers, according to National Highway Traffic Safety Administration data. James Healey wrote the story based on my analysis of hundreds of thousands of records in a NHTSA consumer complaint database. More parents move in with kids: USA TODAY, Sept. 23, 2008. Analysis of American Community Survey data from the U.S. Census showed a growing number of parents, siblings and other relatives living with adult heads of households. In air, health emergencies rise: USA TODAY, March 12, 2008. Using data from 911 dispatch centers, a NASA safety database and a medical company that services airlines, Robert Davis and I reported that in-air medical emergencies were rising — prompted, in part, by longer flights and an aging population. Women feed jump in college enrollment: USA TODAY, Sept. 12, 2007. The 2006 American Community Survey showed women accounted for larger portions of undergraduate and graduate enrollments, part of a long-term trend of men have a decreased presence on campus. Also from the ACS: Young adults delay marriage. First year in college is the riskiest: USA TODAY, Jan. 25, 2006. Robert Davis and I built and analyzed a database of 620 college student deaths that occurred from 2000 to 2005 at four-year colleges and found that freshman were more likely to be the ones dying of alcohol overdoses, falls and health problems. Winner of the 2007 Missouri Lifestyle Journalism Award in the Consumer Affairs category. Alcohol and fire a deadly mix: USA TODAY, Aug. 30, 2006. To follow our college deaths investigation, Robert Davis and I analyzed data related to 62 student deaths in fires at off-campus housing. We found that fires often happened on weekends in the early morning; that students frequently had disabled smoke detectors that would have alerted them; and that alcohol often played a role in preventing students from escaping deadly situations. Church struggles with change: USA TODAY, Nov. 7, 2004. Cathy Grossman and I chronicled the loss of priests and parishes in the Catholic Church in the U.S. From 1990 to 2003, the number of active diocesan and religious-order priests fell 22%, and the number of parishes in 176 dioceses and archdioceses fell 3%. 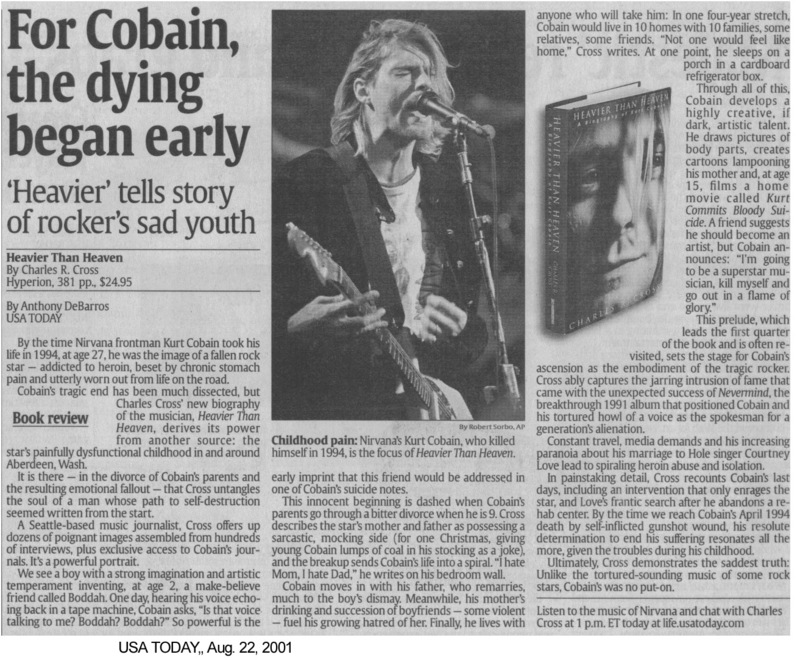 Movie critics, fans follow similar script: USA TODAY, Feb. 25, 2004. My study of critics’ movie ratings vs. films’ box office performance — using linear regression — found that better-reviewed movies tended to make more money, even when factors such as star power were considered. 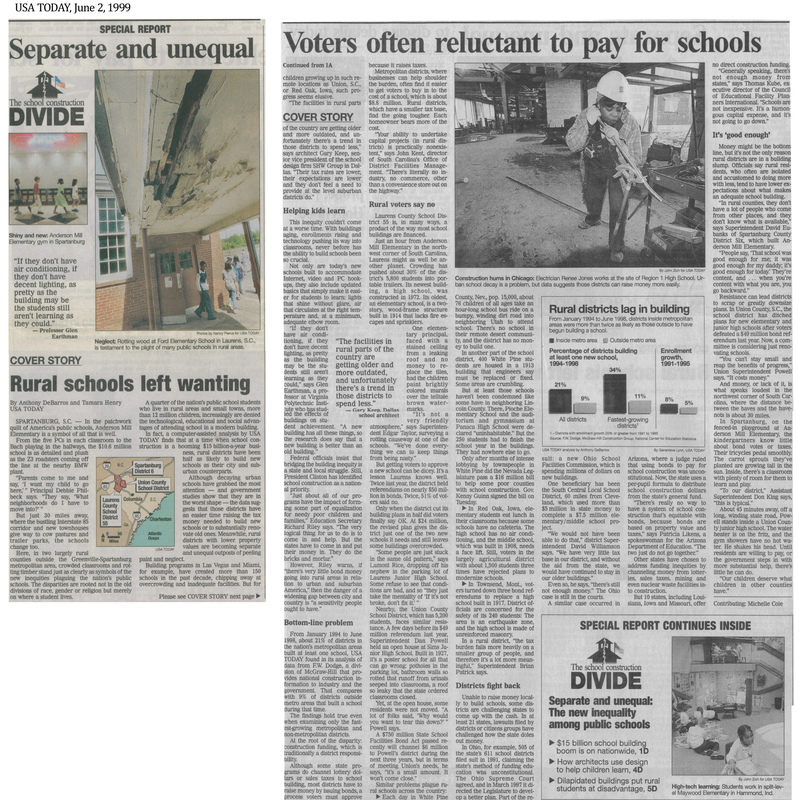 Rural schools left wanting: USA TODAY, June 2, 1999. An analysis of 5,100 public school projects started between 1994 and 1998 showed that although school construction was booming, districts outside Metropolitan Statistical Areas were far less likely to have built a new school. The reasons: smaller, rural districts typically have a harder time passing bonds or raising tax money to finance construction, and states weren’t apt to pitch in. Winner of a special citation in 1999 from the Education Writers Association. 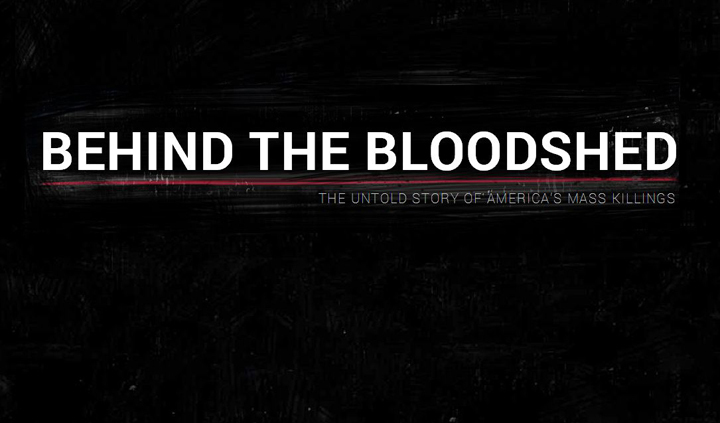 Behind the Bloodshed: USA TODAY, 2013. 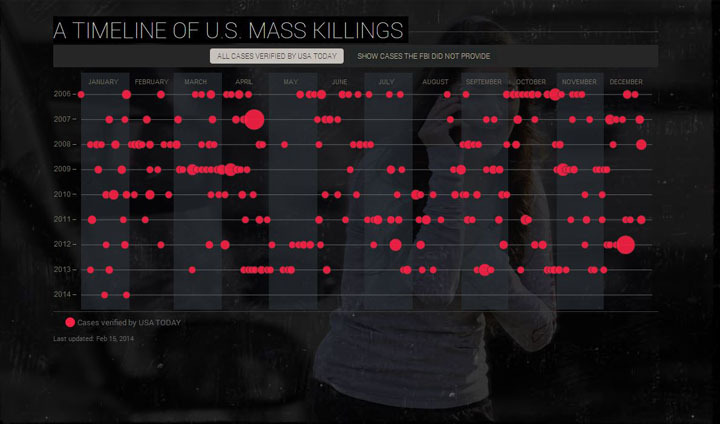 Following the shootings at Sandy Hook Elementary School in Newtown, Conn., the newsroom’s data team compiled records on more than 230 mass killings in the U.S. since 2006. The analysis by Meghan Hoyer, Paul Overberg and Jodi Upton revealed the mass killings — defined by the FBI as four or more victims — happened on average once every two weeks and often involved family or relationship issues. 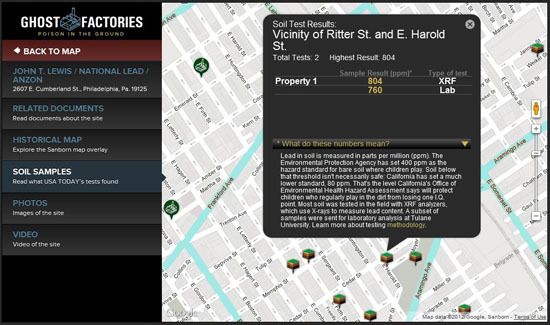 Along with database programming to support the visualizations by Juan Thomassie, I edited the app’s contents, helped manage the project and guid design and development. 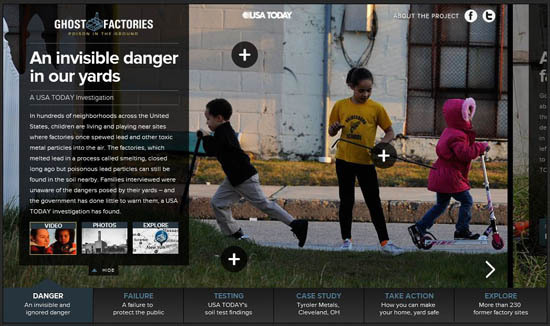 Ghost Factories: USA TODAY, 2012. The newsroom’s investigative team cataloged more than 230 former lead smelting sites that the EPA had known of for years — yet didn’t tell people living and playing near about, allowing them to be exposed to potentially unsafe levels of lead the factories left in the ground. To support the presentation of data, documents, video, photos and soil tests for individual sites, I built a relational SQL Server database, cleaned and loaded data, and personally geocoded each site and soil sample location. I also wrote Python to build individual JSON files containing each site’s data. Nursing home ratings: USA TODAY, 2012. For a report by colleague Paul Monies, I used the DataTables plug-in for JQuery to let USA TODAY readers look up three years of Medicare’s five-star ratings for more than 15,000 nursing homes. The data accompanied a story with analysis showing that more than 500 nursing homes had been stuck with a one-star rating for years even while ratings overall were improving. We’ve made increasing use of this versatile plug-in, and my colleague Christopher Schnaars has written a tutorial on making expandable rows at his site. Census 2010 redistricting data: In early 2011, to report on the rollout of the first wave of Census 2010 data, our team at USA TODAY built a series of state profiles that included a Flash interactive with demographics for each state and county plus DataTable-driven profile pages for deeper dives into the data. My contribution included using SAS to script data import, parsing and export to various formats for distribution. I also built and loaded a SQL Server database to feed the graphic and tables. Flash design by Juan Thomassie. Campaign finance tracker: USA TODAY, 2008. Based on a data partnership with the Center for Responsive Politics, this interactive shows the flow of contributions from people to candidates, parties and independent groups (527s) during the 2008 presidential election cycle. For the team that built this, I assessed the data from CRP, built a SQL Server database and queries, and programmed the ASP.NET application layer to handle requests from the Flash and return XML. Census American Community Survey: USA TODAY, 2009, 2010. Interactive state map with 12 layers of data from the 2008 and 2009 American Community Survey releases from the U.S. Census Bureau. Again a Flash interactive driven by XML, which our team produced over a weekend during a tight embargo. Design by artist Juan Thomassie. Hospital death rates: USA TODAY, 2008-10. Medicare’s 30-day death and readmission rates for heart attack, heart failure and pneumonia for more than 4,400 U.S. hospitals. 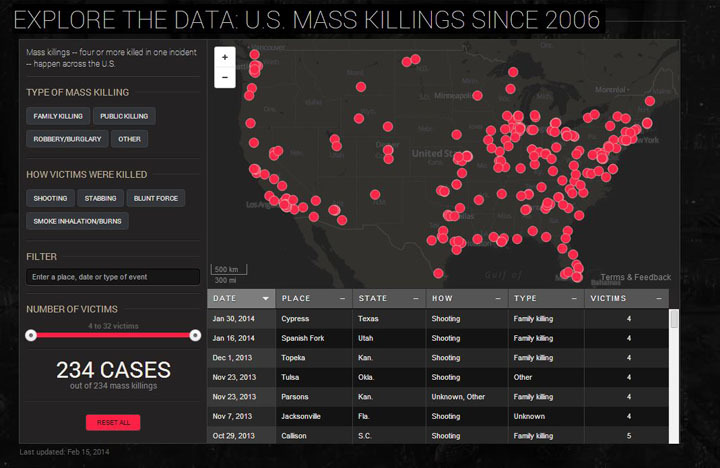 Working with reporter Steve Sternberg, we obtained the data under FOIA request. I contributed SQL Server programming and the rewrite of an ASP.NET handler to return XML to the Flash. Design by William Couch. Entertainment calendars: USA TODAY, 2009-10. To help our entertainment staff catalog and present upcoming releases of movies, books and music, I designed a SQL Server data warehouse with an ASP.NET front end for data entry and search. The app also generates XML to power Flash-based presentations. This example is for winter books in 2010. No longer active. Most journalists will tell you that meeting characters is one of the job’s many benefits. Here are a few I came across. The column samples are from my stint as Life Editor at the Poughkeepsie Journal, when I had much more hair. Filmmaker Ralph Arlyck: Poughkeepsie Journal, 1988. A profile of indie filmmaker Arlyck, whose documentaries cast a wry look at everyday life, art and people. 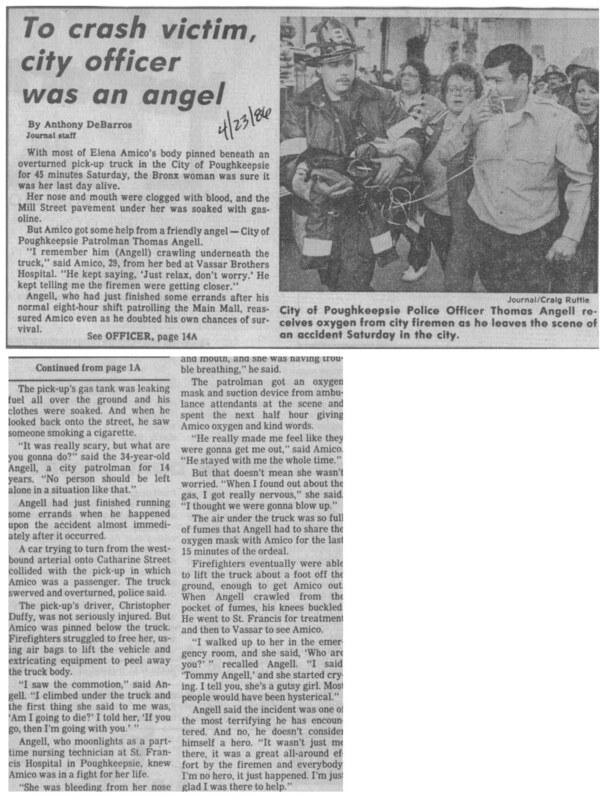 To crash victim, city officer was an angel: Poughkeepsie Journal, 1986. A woman trapped beneath a car. Gas leaking all around. And an officer who just happened to wander by. ‘The Good Rat’: USA TODAY, Feb. 18, 2008. The death of the “wrong Nicky Guido” is just one of the tales Jimmy Breslin pulls out of this profile of a marijuana dealer turned witness against the mob. 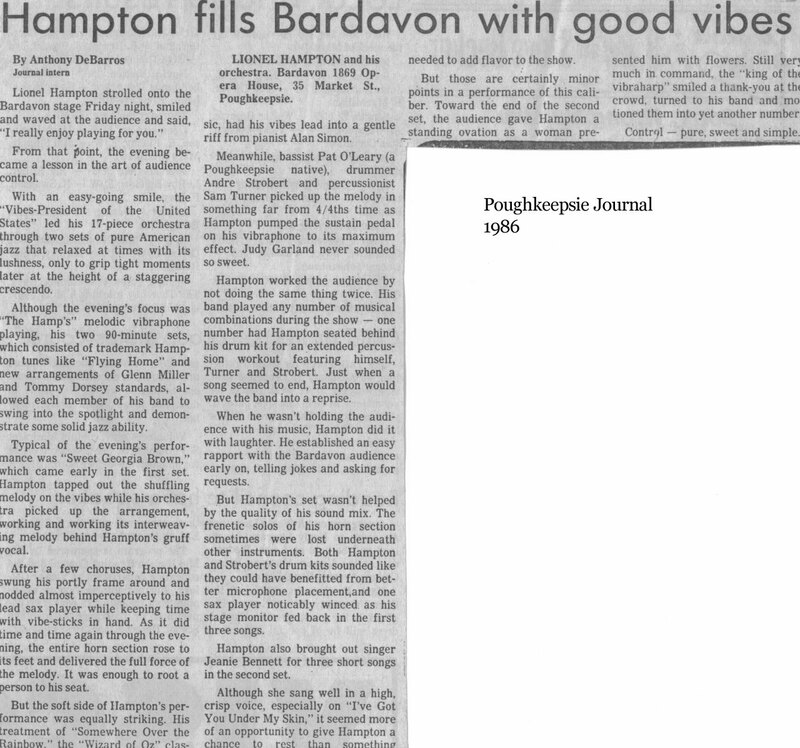 Hampton fills Bardavon with good vibes: Poughkeepsie Journal, 1986. While interning at the Journal, after many nights covering zoning board hearings, I convinced the paper’s entertainment editor to send me to the city’s posh Bardavon 1869 Opera House to review vibraphone legend Lionel Hampton’s show. 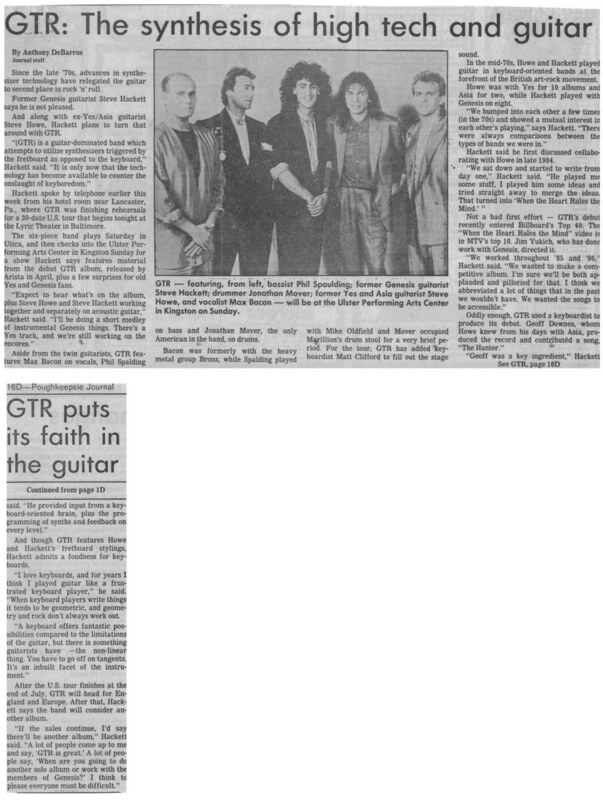 GTR (Steve Hackett): Poughkeepsie Journal, 1987. The former Genesis guitar player talked with me about the band he formed with Steve Howe of Yes. At the time, they were burning up the charts. A year later, they were no more. 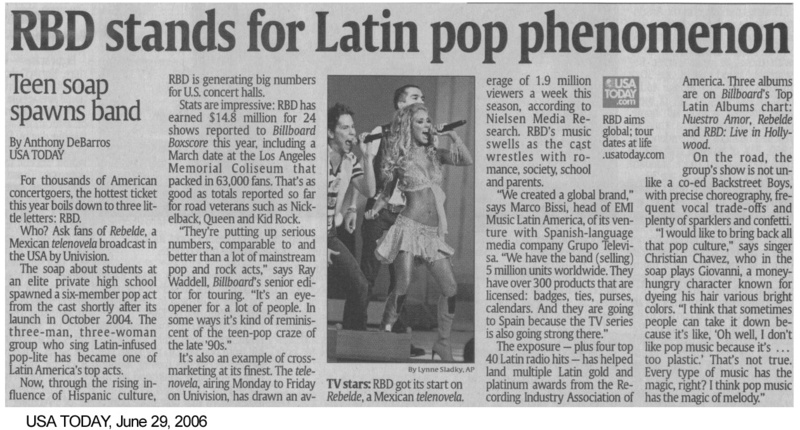 RBD stands for Latin pop phenomenon: USA TODAY, 2006. No matter the language or culture, there’s something about a TV show spawning a music group that translates equally well. After 125 years, the ukulele keeps people smiling: USA TODAY, 2004. “People’s expectations … are very low, and when they hear it, they are flabbergasted at how beautiful it sounds,” one player told me. 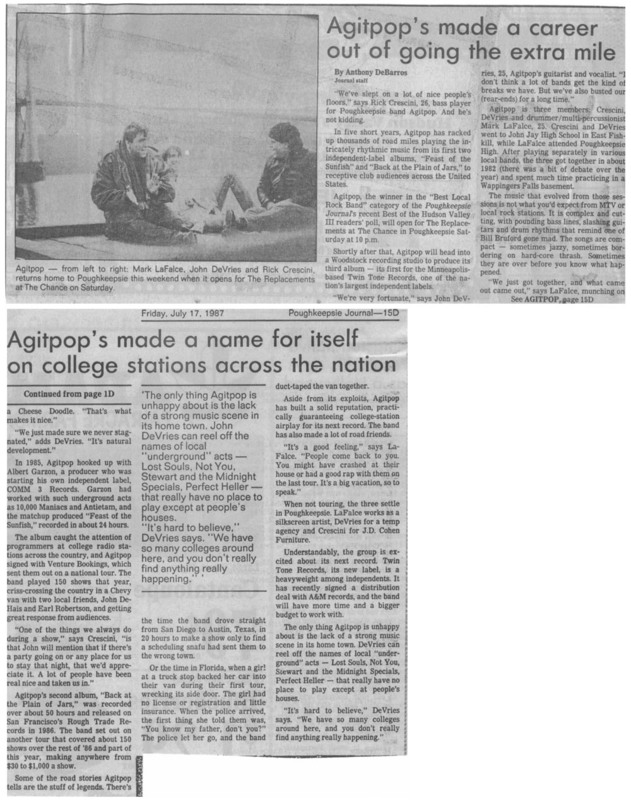 Agitpop’s made a career out of going the extra mile: Poughkeepsie Journal, 1987. What I remember most from this interview (and the show that followed) was this band’s singular vision. Agitpop was like nothing else little Poughkeepsie had ever seen. P.O.D. 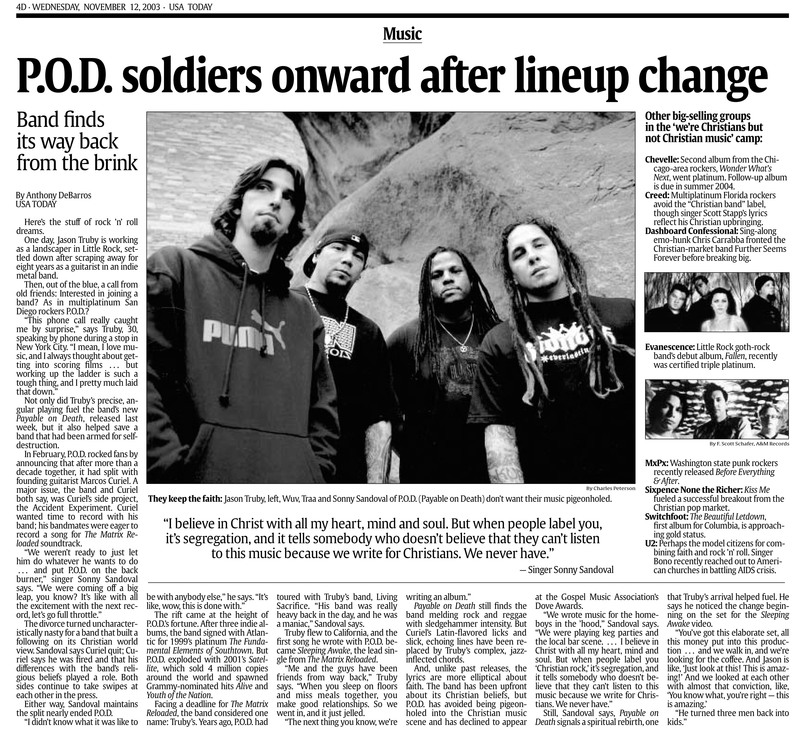 soldiers onward after lineup change: USA TODAY, 2003. Two years after selling four million copies of “Satellite,” I caught up with P.O.D. as it was restarting its career with new guitarist Jason Truby and trying to shed the “Christian rock” tag. 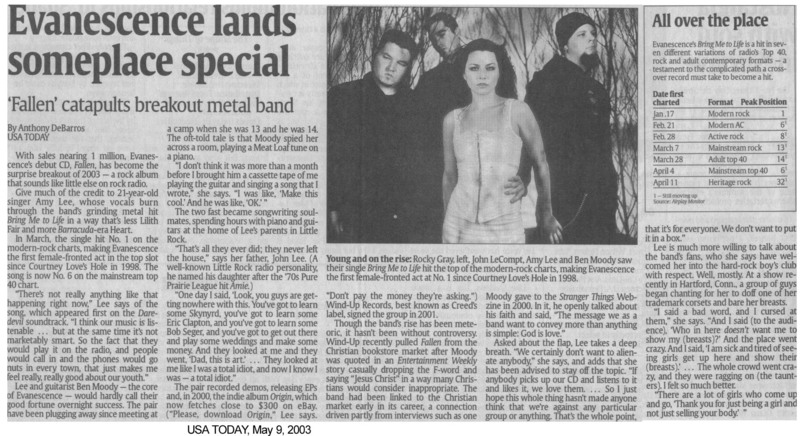 Evanescence lands someplace special: USA TODAY, 2003. In spring 2003, Amy Lee’s soaring vocal on “Bring Me to Life” was all over radio, and Evanescence was on its way to platinum status. But trouble was starting to brew in the band’s camp, and I caught up with them shortly before Lee and co-founder Ben Moody parted ways. ‘Surf City’ is home for Jan and Dean: USA TODAY, 2008: A review of Bob Greene’s memoir about his stint playing with surf rock pioneers Jan and Dean, memorable for two things: its portrayal of band camaraderie and its on-the-button take on life on the rock ‘n’ roll B-circuit. 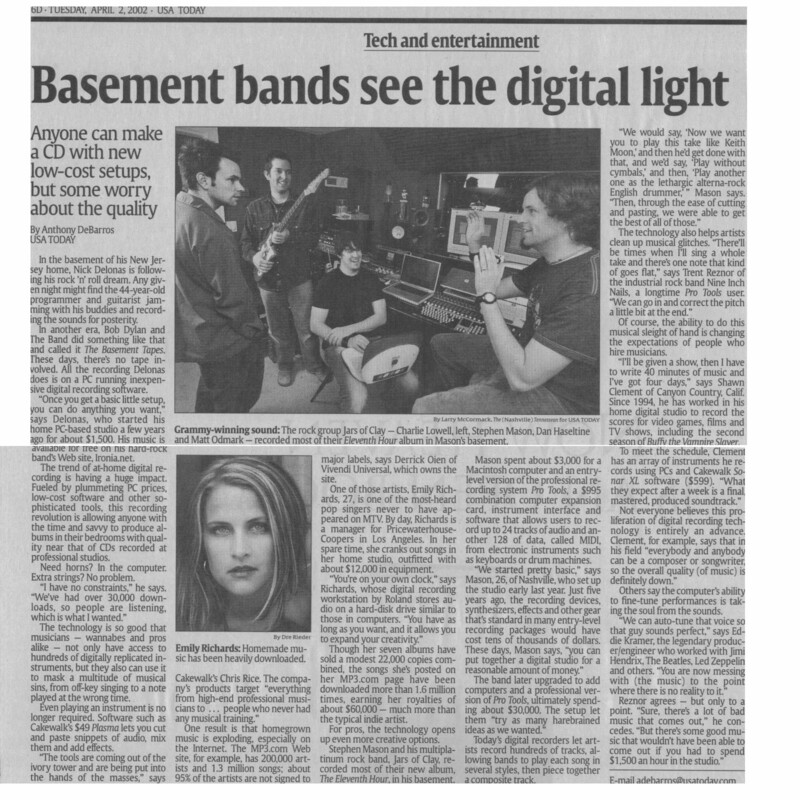 Basement bands see the digital light: USA TODAY, 2002. By the early oo’s, it was becoming affordable to set up a recording studio in your basement and, if you had some talent, make a quality recording. Jars of Clay, Trent Reznor and composer Shawn Clement were among the musicians I rounded up to tell the story. Can IBM dominate desktops? 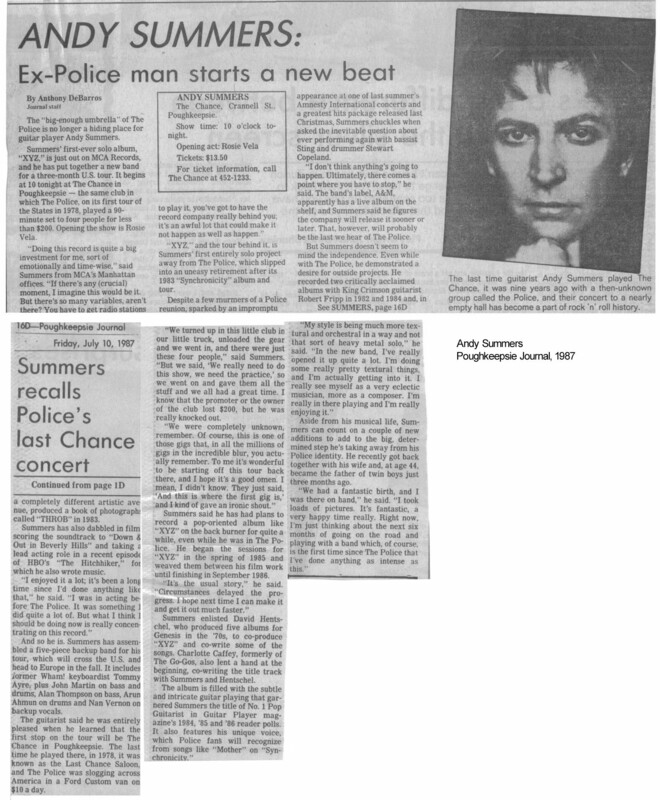 : Poughkeepsie Journal, 1995. As its mainframe business faced an uncertain future, pundits declared that IBM needed to succeed on the PC desktop to survive. To IBM, that meant pushing its OS/2 operating system. 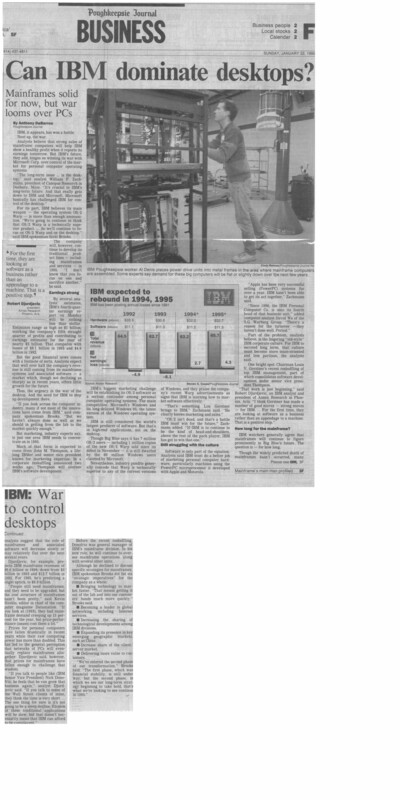 Software must clean up after itself: Poughkeepsie Journal, 1995. One of several columns I wrote for the Journal on tech topics. This one focused on the need for software to behave politely and uninstall itself completely — something that software companies still haven’t managed to do well.